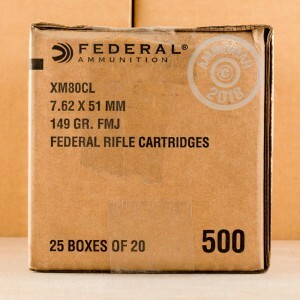 Federal XM80CL rounds are built specifically for the US Military and NATO allies. 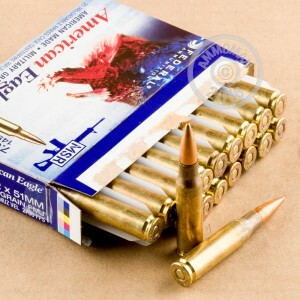 Each 7.62x51mm round loads a 149 grain Full Metal Jacket bullet into a fresh, boxer primed, brass casing. Grab a case today and get out to the range. Great food for hungry M1A's & HK91's. Shipping was very quick. Smooth online transaction process. The brass is disclored where it is necked down and spotted everywhere else. I would guess this is reloaded brass but description says new. The boxes are glued shut and dont easily close after opening. The plastic trays inside the box are bottomless so the rounds will spill out and roll around and cant be contained once the box is opened. 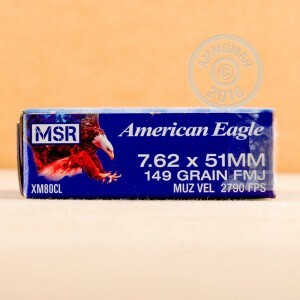 Not sure its worth the premium over XM80CS loose packed ammo, but my range likes to see new in box factory ammo. Reliable performance, 70 rounds in a FN SCAR 17 no problem. What took ya so long? Way ta get a move on, Ammoman!! Y'all don't play around gettin it out the door, do ya? Good stuff here and great price. Very happy with this product will definitely be getting more. Thanks ammoman. Started using XM80 because it groups better than any of the other military style ammo I've tried... especially out at ranges of 400 and 500 meters.